Photographed at Mweiga, Nyeri, Kenya. Dec. 2015. From Wikipedia: Widespread resident breeding bird in Africa south of the Sahara. It is a common, if not abundant, species in most habitats other than desert. This species builds a stick nest in a tree and lays two white eggs. Its flight is quick, with the regular beats and an occasional sharp flick of the wings which are characteristic of pigeons in general. 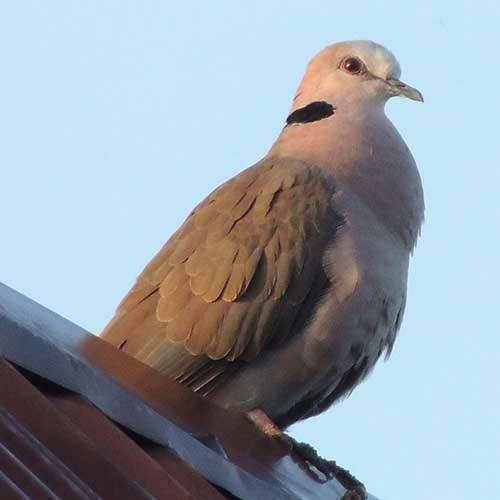 Red-eyed dove is a largish, stocky pigeon, typically 30 cm in length. Its back, wings and tail are pale brown. When flying, it shows blackish flight feathers. The head and underparts are dark vinous-pink, shading to pale grey on the face. There is a black hind neck patch edged with white. The legs and a patch of bare skin around the eye are red. The call is a loud doo-doo-du-du. Sexes are similar, but juveniles are duller than adults, and have scalloping on the body feathers. Red-eyed doves eat grass seeds, grains and other vegetation. They often forage on the ground. Like several other species in this genus, they are not particularly gregarious and often feed alone or in pairs.They can be found in forests near rivers. Copyright Michael J. Plagens, page created 4 May 2016.